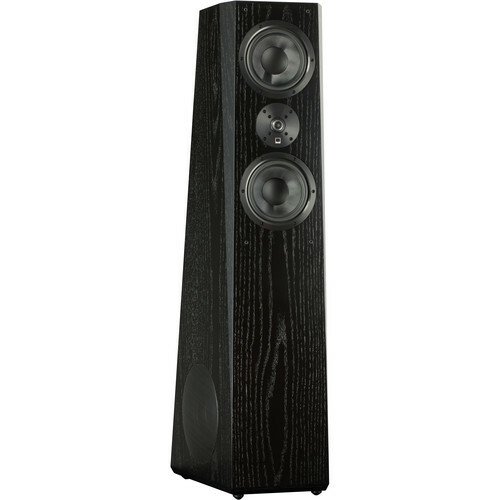 Enjoy a wide frequency response with the black oak veneer SVS Ultra 3.5-Way Floorstanding Speaker. It has a 28 Hz to 32 kHz frequency range for enhanced highs, bass, and mids from its 1" tweeter, two 6.5" midrange, and two horizontally opposed 8" woofers. The 3.5-way crossover allows each midrange driver to output a different frequency for a more detailed frequency response, and its 3.5" bass port is designed to further enhance the bass. This speaker is recommended for 20 to 300W amplifiers. The ForceFactor horizontally opposed, dual-woofer configuration helps provide mechanical force cancellation for reduced distortion and a cleaner bass response. The ForceFactor array also eliminates cabinet vibration, which could otherwise modulate the mid/high frequencies, helping to ensure that the soundstage is stable and clear. Also, since the woofers fire in different directions, the acoustical loading and modal density in the listening space is enhanced, providing a bass response free of room-based anomalies. Box Dimensions (LxWxH) 51.0 x 22.0 x 21.0"